The first thing that Soul Wars does to sidestep the problems typically associated with a tie in novel to an already established event, to much success I must say, is to not follow the same characters. Knossus and Malendrak are both present in the novel, but they're more relegated to supporting characters, with their plot lines only briefly touched upon. By making this simple change Josh is able to free himself up to do pretty much whatever he wants with the story. WARNING: There are minor spoilers here since some pretty major stuff happens fairly early in the book. It would be pretty hard to discuss what goes on in the story without covering some of this in the review. The story opens with Nagash completing his long laid plans from Malign Portents. With Nagashizzar under siege from orruks, he moves the timetable forward and begins his grand ritual right away. Unfortunately for him, Skaven have infiltrated the black pyramid, and the presence of Chaos throws it askew, but not enough for it to be a total failure. As the magical energies of Shyish are refocused into its center, a ripple of necromantic energy blasts out through the Mortal Realms in what would become known as the Necroquake. This whole scene is very cool, and one of the aspects of AoS that Josh has mastery over is in writing the more villainous characters, especially Death ones, in a very convincing manner. I love how Nagash sees the Chaos gods laughing at him as the ritual begins to unravel, and how their laughter ceases once he is able to maintain it. As all of this is happening we are also introduced to Pharus Thaum, a Lord-Castellant of the Anvils of the Heldenhammer stationed in Glymmsforge. There he is tasked with overseeing the protection of the Ten Thousand Tombs, a vast tomb complex buried under the city's heart, left there by Nagash in ancient times. Pharus is probably one of the most human Stormcast I have seen so far. There is a small child, Elya, whom he helped saved in the past, who consistently sneaks past all of his defenses to spend time with him in the crypts. I love his rapport with her, and how much he wishes to protect her. He also has a fondness for apples, which he keeps a supply of to snack on while performing his duties. A Liberator Prime, Calyn, is reassigned under his command at this point as well, a fairly young Stormcast, having only been reforged within the last few years. It's at this point that the Necroquake hits and everything starts to go wrong. We don't see exactly what happens, but Pharus is slain protecting Calyn, and his soul is returned to Sigmaron, just in time for the Necroquake to hit their as well. In Azyr we meet Balthas Arum, a Lord-Arcanum of the Anvils of the Heldenhammer, and our main protagonist. If you're a fan of Warhammer from before AoS, it'll be pretty obvious who he is, but little hints are continually dropped throughout the book. Balthas himself has no knowledge of his prior life, and it's a mystery that perplexes him. As a member of the Sancrosanct Chambers it's part of his duty to help oversee the Anvil of Apotheosis, which also gives us our first look at how Stormcast are actually reforged. It's pretty interesting, and while it doesn't go into all of the nitty gritty, it does make something that was largely abstract before into a more tangible thing. As they are reforging the Stormcast souls, one of the souls goes rogue, something that happens every now and then when they've been reforged too many times, or suffered a really traumatic death. This time it's the soul of poor Pharus, and to make matters worse, the Necroquake hits, sending everything into chaos. During the tumult, Pharus' soul is lost to the aether, and plummets back down to Shyish. It's there that Nagash finds him, and twists him more to his liking. Between Nagash and Arkhan, they strip Pharus of much of his memories, and transform him into a formidable Nighthaunt general. This is a pet project of Arkhan's really, since he sees the potential in using Sigmar's works against him. Armored in spectral armor and given a commanding rank, Pharus is tasked alongside the Knight of Shrouds Malendrak, as well as a really cool deadwalker leader and a wight king, with bringing Glymmsforge to ruin. Pharus though, has a special mission, which is to crack open the Ten Thousand Tombs since he has intimate knowledge of their defenses. With the undead assault imminent, Sigmar sends the chambers of Knossus as well as Balthas to reinforce the city. Balthas can also sense that Pharus' soul is in Shyish, and since he holds himself responsible for its escape, he asks Sigmar for permission to hunt it down. Without giving too much more away, there is a whole lot that happens. We have the main assault on the city, which has some fantastically cinematic moments, but there are also several side threads. Seeing Balthas interact with the city itself, and Calyn and Elya's stories continue to intertwine is just as entertaining. We even get some more character out of the other Nighthaunt commanders, including one who has a link back to another Stormcast hero of Reynold's. The finale actually feels like it takes up the entire back quarter of the book, but not in a bad way. Since the siege is broken up into several set pieces, such as the assault on the gates, the confrontation with the main Stormcast force, and the final assault on the tombs, it has enough flow that it doesn't get stale. The main story in this is great, and like I already said, the battles are expertly written, with some truly evocative moments. Where Josh always excels though, is in his character work. Nagash and Arkhan continue to shine in the few scenes they get, but here we get a little more of a look at possible secret plans Arkhan has. I love good ol' second in command, and to see that his story may get fleshed out and have more time in the spotlight is always good news to me. Josh does such a good job with all of the Mortarchs I would really love to see him tackle Olynder in a story, even if it's just a short. The main characters of the novel is where the real meat is though. Out of all of them I think the Pharus, Calyn, Elya arc is the best. Though the twist with Calyn is pretty obvious from early on in the book, it's still a good story moment. I don't know if it was really meant to be a secret from the reader anyway, or just a secret from Calyn herself. Elya doesn't have much growth, but her use as the Stormcast's link to humanity is great, and the little quirks with her and her cats is nice. I particularly like how this small child can continually slip past all of the defenses and patrols that the Stormcast have erected to keep out the worst of the Mortal Realms. Pharus has the most interesting arc, essentially falling from Sigmar's grace and then being twisted to suit Nagash's purpose. This is the first time we've seen a Stormcast used in this way, and I think it opens up a ton of possibilities about the future. Their souls are not as incorruptible as we may have thought. Balthas is more our point of view than anything else. He's got his own secrets of course, ones that he isn't even aware of. He's always on the lookout for more knowledge and pretty much keeps everyone at a distance, even those under his own command. Knowing who he is, and the potential that he has I would definitely like to see more of him in the future. It's a pretty interesting story hook, and another first for AoS. Everyone knew it could be possible that there were characters from the world-that-was as Stormcast, but we had never seen it confirmed before now. We also get a few scenes with Sigmar himself, which I always love. This is one of the things that makes AoS great in my opinion, our Emperor level character can still interact and talk with those around him. It makes the struggle of Sigmar and the forces of Order that much more personal. This wouldn't be a Josh Reynolds novel without several callbacks to his other works, and for those who keep an eye out there are plenty of them. None of them are overtly obvious in a way that would district from the main story, but I love the continued expansion of the Reynolds-verse. There's the Lord Executioner connection I mentioned before, as well as a character from Black Rift in there, as well as several more. The one thing I do have to mention, and this is something that was out of Josh's hands, is that you can tell that this was being written at the same time as some of the new Stormcast stuff was still being developed. There are only two inconsistencies, and they're not big deals, but it can confuse you a bit at first if you're not familiar with everything. The Evocators are called Celastors and the Knight-Incantor is called a mage-sacristan. These were probably early versions of the unit names that were changed after the novel already went to print. Like I said, not a huge deal, but if you're confused while reading this, that's why those units may not seem familiar. I really enjoyed this book, and it expertly handled the tie in to the Glymmsforge event. 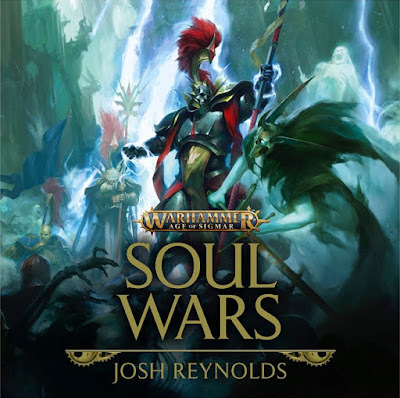 Josh continues to shine with his character work and world building, and Soul Wars is the perfect launch pad for the new AoS story arc. I'm definitely excited to see the expansion of Death as the main villain of the setting, especially since Josh has such a handle on how to write them. If you're a fan of AoS fiction I highly recommend picking this up. You can get it in print, digital, or as an audio book too!